Through Sampleo.com, I received the Dodow for testing. 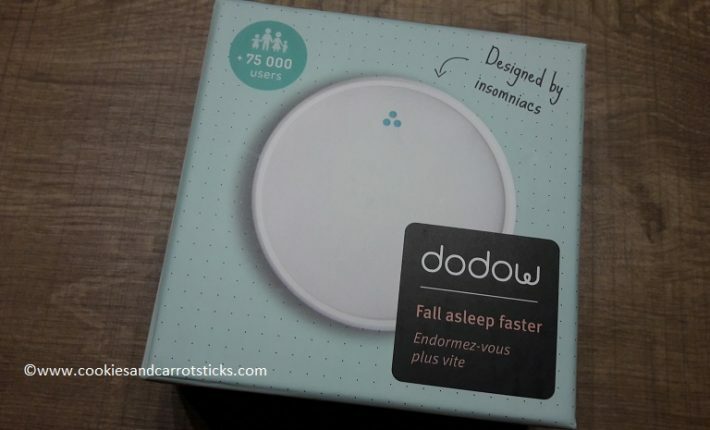 A small device that’s supposed to help you to fall asleep faster. When I saw the call for testers, I applied right away. Because falling asleep is one of my battles I fight almost every day. 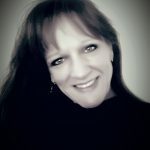 I was over the moon when I got confirmation that I was one of the lucky ones. Getting the Dodow almost turned into a battle as well though. From the company selling the Dodow, I received an email with the tracking code, which was perfect. The first few days, the shipment was still in pre-alert status and not traceable. No worries yet, though, that does happen a lot. After a few days, I checked again and the package had been transferred to DPD. The delivery would take place on Wednesday. Two days later, still no package, and I traced it again online. What does it say? Wrong address?? That’s impossible. What was the problem? 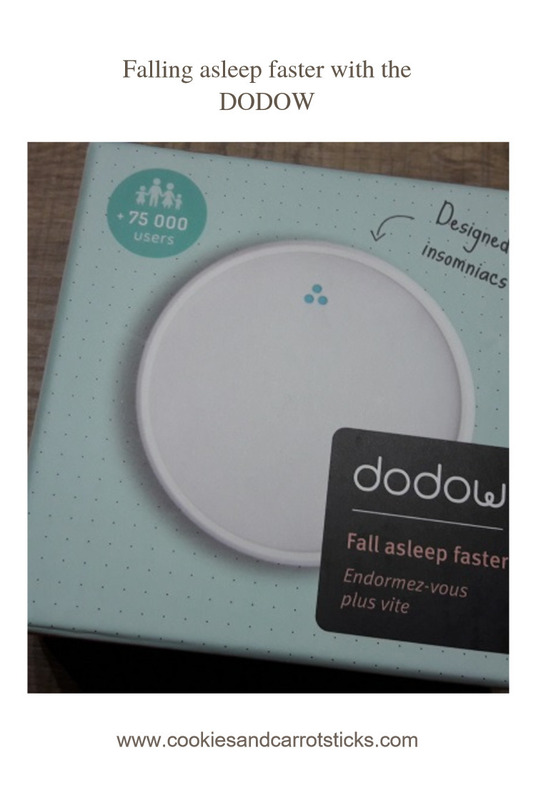 The Dodow is sold by a French company. In France, addresses first state the number and then the street name, which is different from our addresses. So, instead of using this ‘foreign’ (read: Dutch) setup for the address (as it was given), they used the French setup for the address on the package. Thinking that DPD (European carrier) would be able to interpret “1, street name” correctly and turn it into “street name 1”, proved to be too difficult. The package ended up at the depot, with the remark ‘wrong address, missing number’ (even though the number was there, just in front of the street name instead of behind it). Good thing now was, that we could arrange an exact appointment for the delivery. Which was for Wednesday of the following week. A week delayed. Oh well, I finally got my Dodow! I was so happy when I got it. Of course, I unpacked it immediately and prepared it for the first test night. 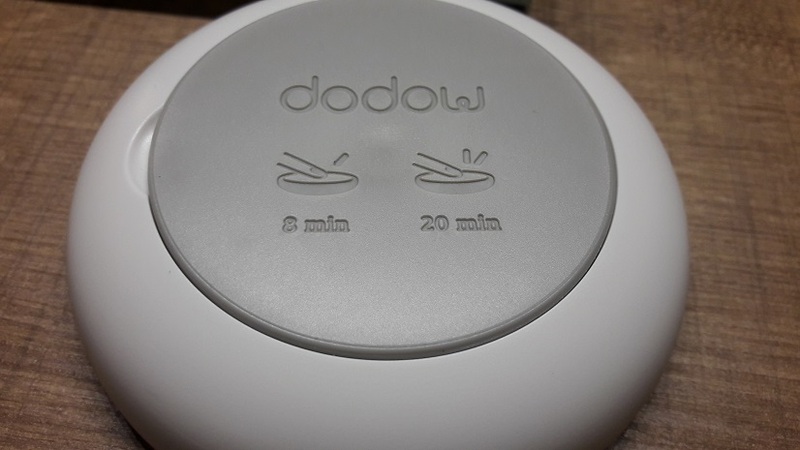 The Dodow comes in a small box, with easy to read instructions (in several languages) and a few tips to get the most out of the Dodow. 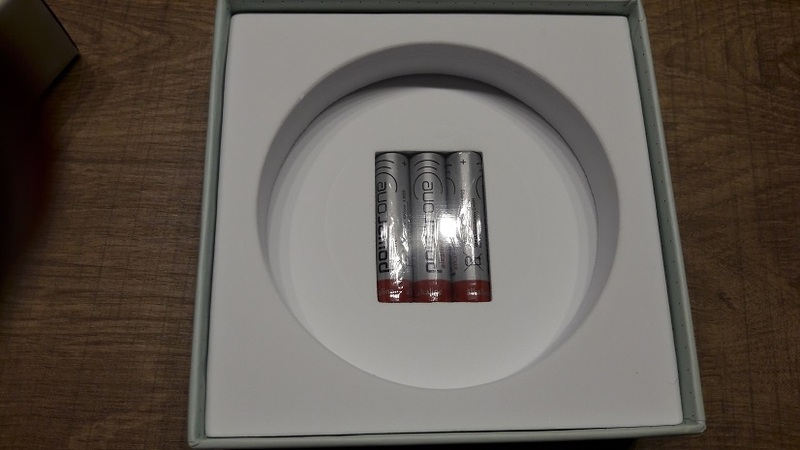 Very nice: batteries are included. Ready to start in no time. I have to admit that I was pretty sceptical. 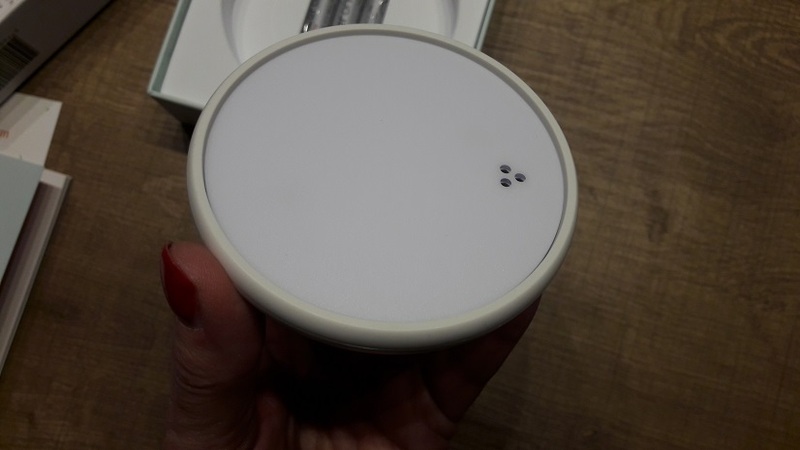 How can a simple small light help you to fall asleep, while all other methods failed? But I wanted to give it a fair try. First of all, you can set the intensity of the light. I’ve selected the least intense setting and that was still bright enough. It was quite the search to find the perfect spot to place for Dodow. Due to the deep head board of our bed, the nightstand was too far back for the light. Putting it next to me on the floor wasn’t an option either, as it cast shadows on the ceiling, leaving just half of the circle. Eventually, I put it on the head board and to prevent that I would have to bend my neck backwards to see it, I put something under it to give it a tilt. Now, I could lie relaxed in bed and watch the circle.  You turn the Dodow on by simple tapping on it. Once for 8 minutes, twice for 20 minutes. I chose 20 minutes to start with, as 8 minutes seemed way too short for me. Especially if you consider that I’m used to tossing and turning for at least 30 to 60 minutes before falling asleep. I could not imagine falling asleep in 8. 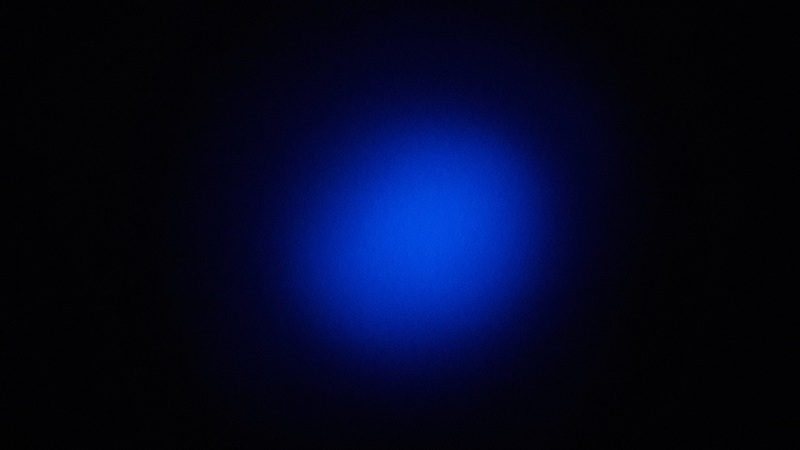 A blue circle is cast on the ceiling, which is getting larger and brighter, then fades to almost nothing. Now you need to try to follow the rhythm of the light with your breathing. Breath in while the circle gets larger and brighter, exhale when the circle fades. Put your hands on your stomach and concentrate on your breathing. That took some practising at first. Apparently, I was breathing way too fast, so I had to hold my breath a couple of times to adjust my breathing to follow the rhythm of the light. But I did get used to it quite fast. By focussing on the light and your breathing, you start to calm down. To me, it feels like a kind of a mix of meditation and hypnosis. Like I said, I was pretty sceptical. But I have to admit that I am pleasantly surprised. After just a few minutes, my eyes started to droop and I could not keep them open. After that, it must have taken just a few more minutes and I was asleep. I did not notice when the Dodow shut down. 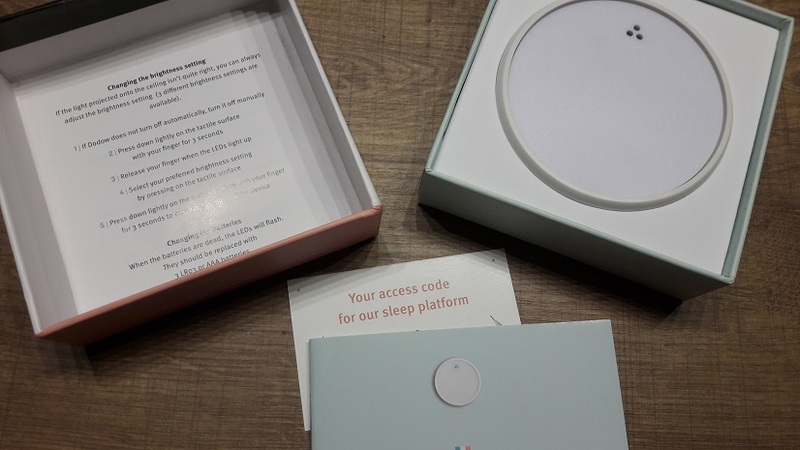 I’ve tested the device for just a small period of time and in that time, it has helped me to fall asleep faster. But it was also a time with less working days, the holidays, Christmas break of the boys and I got the flu on top of it all. So, I will be testing for a while longer, now that that our lives are getting back to normal again. What I have experienced so far, is very positive. We may also try to use the Dodow for out 9-year-old son. A real night owl, who is usually far too awake when it’s time to go to bed. He also has trouble falling asleep at night. This might just be the solution to his problem as well. Will I recommend the Dodow to others? Based on my own (short) experience, I definitely will. But like with so many things, this might not work for everybody in the same way. Never know till you try. It’s not very cheap, but if it works, it’s worth the investment for sure. on my own opinion and personal experience. Klinkt goed. Misschien een ideetje voor mijn mama. Die heeft vreselijke slaapproblemen. We zijn ‘m nu aan het testen met de oudste. Hij slaapt wel niet binnen de tijd (ook niet op 20 min) maar geeft wel aan dat het hem rustig maakt en slaperig. Dat alleen al is een grote vooruitgang. Van de 5 avonden is hij maar 1 keer naar beneden gekomen.